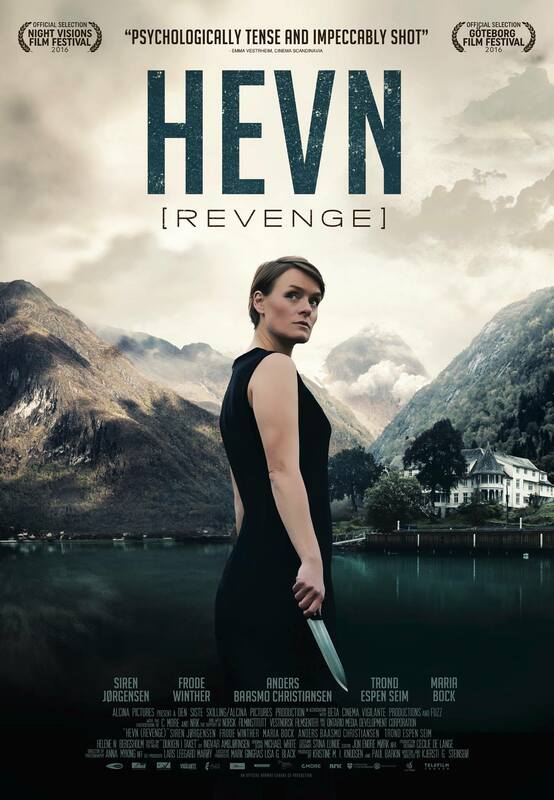 Hevn (Revenge) directed by Kjersti Steinsbø stars Siren Jørgensen, Frode Winther, Maria Bock and Anders Baasmo who once again bring a cinematic experience of a level only European movies can reach. It has a clear direction from the start, develops the characters in a way you miss nothing, and the conclusion is such you would not wish to have another one. Hevn follows Rebekka, who travels under a false identity to find a man who is responsible for the death of her younger sister. It’s Morten Holand, a local ‘Golden Boy’, whose dark past secret seems to touch not only Rebekka’s sister, but a few others as well. However, the payback comes soon to him when Rebekka plots an excellent plan to destroy his perfect life and turn everyone he knows against him. For that, she needs a bit of help to trigger his dark side to come out for everyone to see it…. Rebekka introduces herself as Andrea, a freelance writer for a Travel Magazine who is assigned to write an article about Morten’s hotel. By the time when Andrea/Rebekka knows Hollands’ house, she finds him happily married to Nina with an infant. Even that fact does not stops Rebekka to continue the execution of her brilliant plan. However, in the beginning, it seemed she wanted to use the gun she carried with her, but perhaps, it was his idyllic life she finds more important to be destroyed rather than taking his life…. As the story unfolds, we find out more about Andrea’s past and that life-changing event when Rebekka’s sister was molested by 19 year old Morten. But Rebekka clearly realizes that someone who molests a young girl once will always continue doing it until someone stops him. To prove that theory, she starts texting him with a welcoming subject that quickly draws Morten’s attention. This is when Rebekka knew her plan is bound to succeed. Hevn is the first Norwegian/Canadian co-production in 16 years, and I must say, the result of it is superb. It sets the perfect path for Rebekka to consciously follow her plan to avenge the death of her sister. The screenplay is also written precisely, holding intentionally a bit of information which unfolds as the film progresses as if it were a Christmas gift you eagerly unpack. Performance of the entire cast delivers unarguably one of the best acting I’ve seen in a while, especially Siren Jørgensen, who captures the determination of Rebekka the way you knew right away that nothing will ever stop her until she ends what she has started. In conclusion, Hevn is about revenge, about bringing someone to justice and that sometimes crossing a line is the only way to make things right. Certainly, the point of Hevn is not about justification of killing, which never happens in the film, but to show the real and ugly face of a well respected man in a well established society. That moment of truth for someone like Morten Holland is worse than getting killed by a knife or a gun because nothing can be worse than to see hated looks of his best friends after they find out who he really was.